I have this thing with magazines. I really love them. I buy them, then I look through them, then I fully read them, then I go through and mark the pages I really love, then I go through and cut said pages out and put them in my books (which is another blog post of itself). I recently picked up a few back issues of this magazine in an antique store for a dollar or two. I had always saw them in stores and loved the look of them, but never the price tag. Well lets just say, the most recent issue was purchased on news stands, full price. I can't even bear to cut them up. I love rereading them over and over again far too much for that. What types of articles are we talking that make them that good? "Tall Order" featured 10 DIY projects for repurposing old ladders. "Too Cool for School" featured some creative ways to use old school goodies (some of which I may be trying). "Frame Work" consisted of some awesome ways of framing photos, most of which used items I would have never considered. 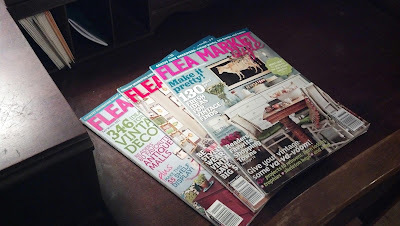 Other than those specific project oriented articles, there are also several others on the flea market experience and decorating with all the goodies you find there. So basically it's like a little idea book that just so happens to expand the wish/to look for lists. And makes me crave the flea market season like crazy. I'm ready for it. I'd like to,buy that magazine too, I purchased it once, why, why, are magazines like that so expensive?? And there are so many magazines, you wonder how they all keep publishing! Exactly! Really the only thing I have against the magazine is the price tag, which is a shame since the entire thing is so fun to read. I'm thinking it just might become a guilty indulgence for me though...since it does keep me occupied for hours hehehe.